The Tokyo Japanese Whisky Tour is a tour to visit some good whisky shops to buy/sample and an excellent bar to try them in Tokyo. As it is now highly recognized in the world, the excellence & perfection of Japanese Whisky is just remarkable. Couples of brands are now well known but most of the other brands are not, and the premier/vintage ones are very difficult to get these days. We will visit 2 ~ 3 liquor shops and a bar to enjoy sampling/buying/drinking Japanese Whisky with whisky guide in English. Transportation between places and sampling are included. At your hotel or anywhere in Tokyo & Ginza station area. We will lead you some nice liquor shops deal Japanese Whisky from high-end ones to unknown-but-good ones. Move to the city of whisky bar, having a ride of commuter bullet train runs inside of Tokyo. All reserved seat. 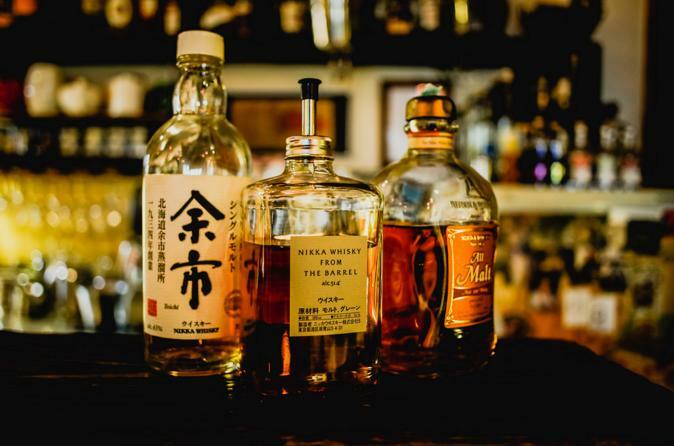 We will bring you to a unknown-but-super-good whisky bar in a city in Tokyo.